Catalina Resources PLC ("Catalina") is a UK-registered, mineral exploration company established in 2006 to find, explore, evaluate and develop mineral resources in South America. 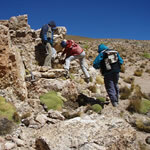 The focus is on Chile, the most mineral-rich country in South America. Operations in Chile are managed by Catalina's subsidiary, Chile-registered Minera Catalina S.A.
Catalina owns two areas recently in northern Chile – Jiguata (10,000 hectares), and Toculla (3,300 hectares) - detailed descriptions can be found under Projects elsewhere in the website.